As the global economy goes through turbulent times, it is becoming clear that art is regarded as one of the few investments which people regard as a safe bet. But, as a trip to Nairobi recently reminded me, there’s more to art than money, despite the relationship the two are often seen as having. Local art collections and sales are on the rise, and with an increasing population of young, upwardly mobile people looking to culture as a hobby, I set out to discover the motivations driving several local collectors. Last week I spent a few days in Nairobi, where I was accompanying Lia Gieling, the curator of the National Art Gallery of Rwanda. We met many artists and visited many studios, which was a very enriching experience both visually and intellectually. “Anyone who purchases an artwork for themselves is a collector. It will always start with the one, and I imagine that in very rare cases the one might be all that is needed”. He says he first heard this himself from a curator some years before and it stuck with him the same way. 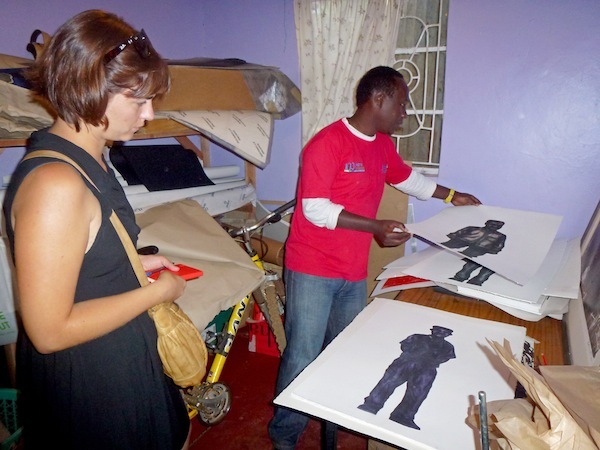 Anna Kućma visiting the Kenyan visual artist Peterson Kamwahti at his studio in Nairobi. Most of us like surrounding ourselves with beautiful objects, but not so many become serious collectors of “Art”. I own a few pieces of art myself; mostly given to me by artists I worked with. I love having art around me, and I definitely don’t mind spending money on it when I have some to spare. I wouldn’t call myself a collector, but I think I’m heading that way. Peterson’s remark may have just been off the cuff, or it may have been meant as encouragement, but it set me off on thinking about all of the different ways in which art can be purchased, and about the different motivations behind those acquisitions. The global trends in the art market have surprisingly shown that, during the recent times of global economic recession people increasingly see buying and collecting art as an investment rather than a passion, and art pieces have reached record prices at annual art auctions in New York and London. 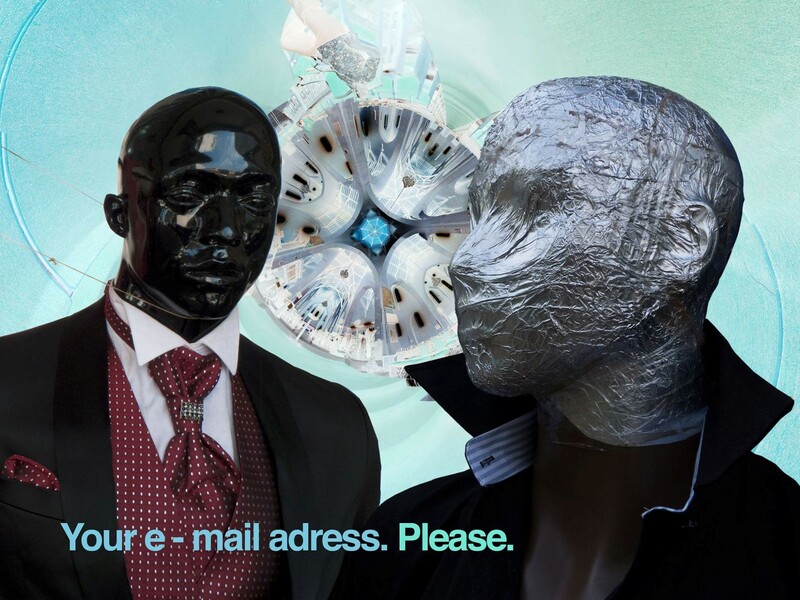 “I realized that the potential art collectors need support and guidance too. The art scene in Nairobi is hard to negotiate if you don’t have someone to show you, and we have that information,” says Danda. Their focus is on serving their clients best in terms of “offering works that work”. 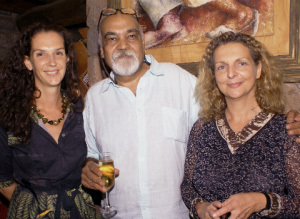 Danda and Fiona are currently busy planning the first ever auction of modern and contemporary East African art, which is scheduled to happen in Nairobi in November 2013. Fiona Fox (left) and Danda Jaroljmek (right). Photo by courtesy of Circle Art Agency. 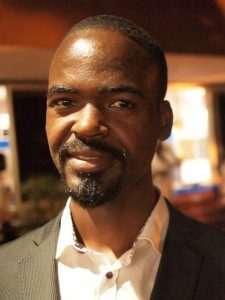 Daudi Karungi, who has been running Afriart Gallery in Kampala for the past ten years, also offers similar services. He serves a range of individual and corporate clients, from experienced collectors to visitors looking to expand their knowledge and/or collection of contemporary Ugandan art. Gallery owner and art collector Daudi Karungi. But Daudi is himself first and foremost a collector with a great passion for his hobby and the fortune to have made it his job too. He explains that he started collecting Ugandan art in 2002. In the beginning he was buying those art pieces, mostly paintings, which he found to be the interesting, unique or special. It has always been an instinctive decision, never an investment, just a feeling of wanting to own that particular painting or sculpture. His collection has grown over the years and now consists of 89 pieces, which he hopes to permanently exhibit in a museum he is planning to build. At the moment he also works with 15 Uganda-based collectors, helping them to develop their collections and to understand what are they looking for. Some collect for passion and some as an investment, but all feel passionately about the art of collecting art. Klaus Betz, who I had the pleasure of working with on an exhibition at MishMash Art Gallery last year, has been collecting Ugandan art for the last 35 years, and every time I visit his house for a cup of tea I see a new piece. The collection is a reflection of who you are, your way of thinking and your way of life, he told me once. He recalled once that his interest in art started while he was walking with his parents in Germany and saw beautiful sculptures in a park when he was 6 or 7 years old. 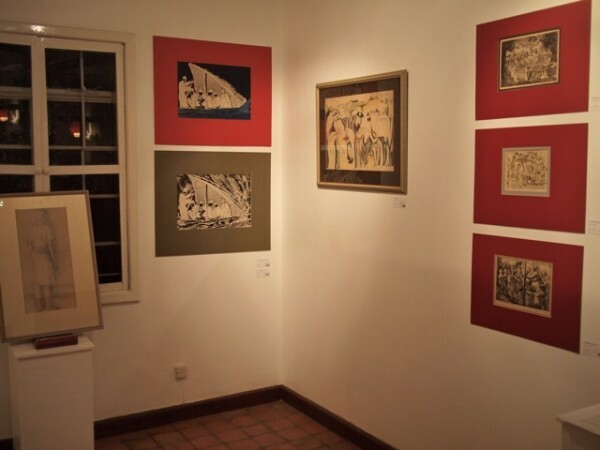 Throughout the 70s, 80s and early 90s, Klaus collected Ugandan art together with his friend, Jochen Schneider, who was an engineer who came to Uganda to work for Roko Construction and was very passionate about art. The pieces mostly came from Makerere Art School and Nommo Gallery, but Betz and Schneider also travelled the country in search of unique pieces. By the end of the 90s, Schneider went back to Germany where he died shortly after his return. Supposedly his inheritors didn’t know what to do with all the art he gathered during the years, and the collection was in danger of being destroyed by the family. Something he had spent his life on amassing was at threat simply because his family didn’t share his enthusiasm and understanding for art. Fortunately, the Weltkulturen Museum in Frankfurt acquired some parts of the collection, and the family donated the rest to the museum in 1998. The collection comprises about 1,200 works and 123 of those are paintings by Jak Katarikawe and many other established Ugandan artists. Some of those date back to 1960s. At the moment, after many years of being forgotten, the collection is being documented and researched properly by the museum. The collection owned by Betz would not serve as a complete history of Ugandan art on its own, but it is at the same time fascinating. Both the Betz and Schneider collections act as records of Uganda art history, and represent a broad cross-section of artistic production in the country during the years. And individuals who were not particularly wealthy or, at least initially, knowledgeable collected them both. The exhibtion of Klaus Betz collection, at MishMash May 2012. So what do you need in order to start collecting art? Some might say a lot of money. However the charming documentary shown recently by the Hub Kampala, titled “Herb and Dorothy”, tells the tale of a postal clerk and a librarian who built one of the most important collections, of contemporary art in history. The Vogels were collecting artworks guided solely by two rules: The piece had to be affordable, and it had to be small enough to fit in their one-bedroom Manhattan apartment. According to Daudi Karungi, the most important thing is the willingness to invest time. Time to understand what to look for and to develop certain aesthetic and knowledge. But most of all, what is needed is the passion for art. In the end I suppose collecting is a sort of addiction. Whether you’re doing it on your own, driven purely by your instinct and your sense of aesthetics, or you hire people like Danda or Daudi to help you and treat it more like an investment. As Peterson Kamwathi said, once you started you will probably never stop. And if you have got the passion for art you are probably already collecting, even if you don’t already know it. Anna Kućma is an independent Polish curator and arts professional based in Kampala and working on variety of different projects across East Africa. in my opinion every ugandan artist should first of all collect their own art work,then collect the work of their contemporaries and make sure these works dont leave the country.this will make a lot of sense in the near future. and finally its not about numbers of art works but aesthetic value.NOT every “good” work deserves to be collected.